VWO Visitor Recordings allows you to record visitor interactions on your website in a video form. Analyzing these videos can help you map user journey on your website and figure out exactly why they are leaving, what’s stopping them from buying, or where do they spend most of their time on a page. To get started, click Recordings under Analyze on the navigation bar. This takes you to the Visitor Recordings dashboard where you can view the list of sessions recorded from the account. To record activities on a page, click Create View on the panel to the right. To set up a recording, you can start by entering a title for the view by clicking on the pencil icon against New View. Then, specify the URLs of the pages where you want to record sessions on. You can use URL patterns and regular expressions to record sessions site-wide and on multiple pages. 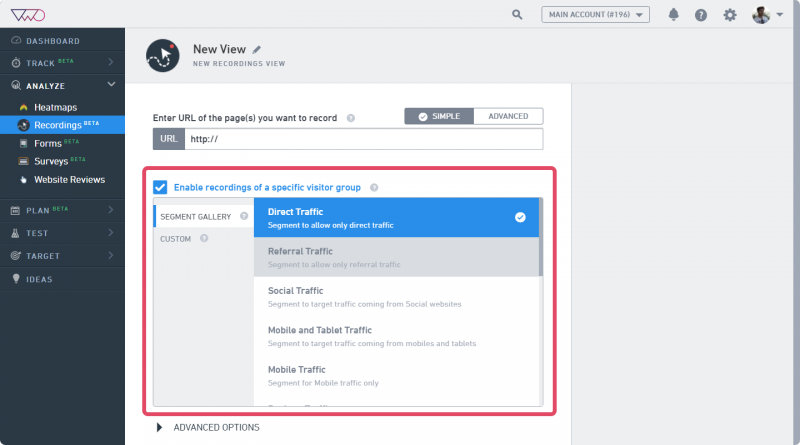 You can define a visitor segment for the test to capture data of specific visitor groups. You can create visitor segments based on different conditions such as geographical location, user device, and other user behaviors. To learn more, click here. You can schedule your test to run, pause, or stop at specific times. To learn more about using the scheduling option, click here. Click Create to complete the setup process.